Here Are Some Do’s and Don’ts to Consider About Your Hot Tub Project! Many of us spend all winter dreaming up ways to spend our tax returns. One of the most popular rewards during tax season is buying a luxury hot tub that can be used to enjoy the starry skies all summer long. But, as with many great wishlist luxuries, purchasing the hot tub is only part of the package. There is still the installation of the hot tub to consider. DO: Make yourself familiar with the NEC Hot Tub Electrical Code. Even if your installer is handling the project, the more you know, the less likely you are to be taken advantage of by your contractor. DON’T: Pick a spot under power lines to install your hot tub. Not only is this dangerous, but a review of that NEC code will prove this to be in violation! DO: Make sure the shut-off is accessible. It must be within five feet of the tub, and it must be visible to users. DON’T: Install low-voltage lighting within 10 feet of the hot tub (even if it’s GFCI protected). DO: Use flexible connections only under these conditions: flexible conduit, liquid-tight flexible metal conduit or liquid-tight flexible nonmetallic conduit less than six feet in length, cord and plug connections, and cord and plug connections with GFCI-protected cords no more than 15 feet in length. DON’T: Wear your everyday clothes in your hot tub. It’s just not a good look! If reading through these do’s and don’ts got confusing, that’s evidence that you’ll need an expert to handle your hot tub installation. 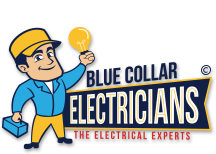 It’s time to contact the experts at Blue Collar Electricians to handle your project! Schedule a visit today, and our team will make sure that everything goes smoothly from site selection to installation!